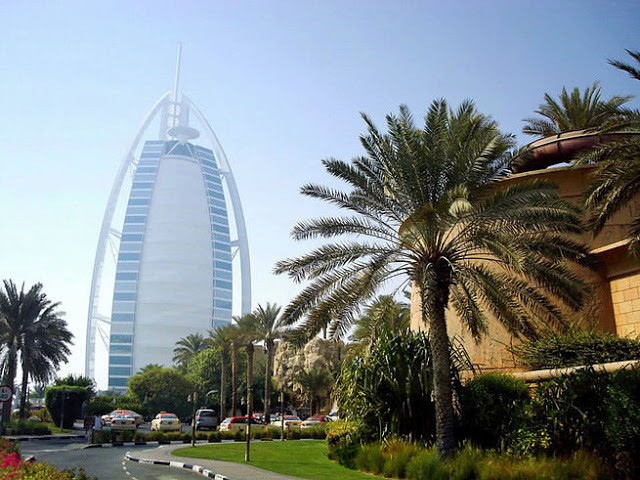 Burj Al Arab is an iconic architecture in Dubai featuring a sail shape right at the coast of Jumeirah. 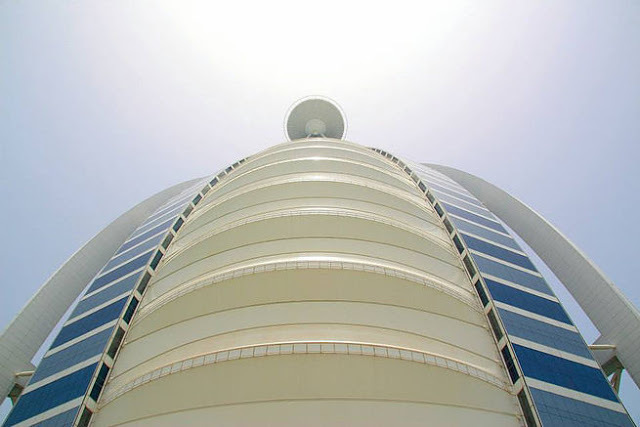 The hotel silhouette is easily recognized on Dubai's skyline The hotel is usually fully booked due to its high quality customer service, hospitality and out-of-the-world experience. Upon arriving, you will undergo a strict security check at the driveway. The security office already have a list of expected guests, if your name is not in the list you will not allowed to enter the premise. I appreciate the security measures, but as a commoner, it does feel awkward to be seated in the car and have the car scanned entirely. 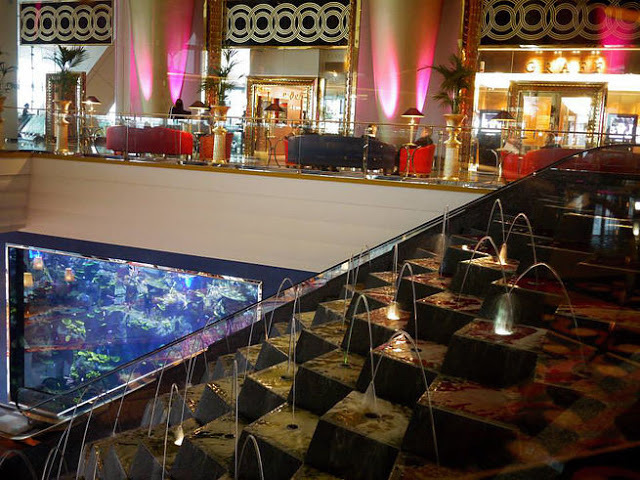 You will be greeted with a extravaganza fountain at the lobby. The usual sights at hotel lobby where people waiting with luggage and the receptionist keying in details of clients at the counter are totally non-existent. The hotel staff will be expecting your arrival and prepare to transport your luggage into the room floor. Each floor has its own reception to ensure the guests comfort and privacy. Check-in is as smooth as silk - no waiting in line, no documentation and no forms to fill. Since this hotel is frequent by politicians, celebrities and high-ranking businessmen, I do see why they have to pay so much details in their hospitality. Now, to the room. The furniture are covered in velvet and the bed sheets are made of silk. This is by far the most exorbitance hotel stay I've ever stayed in. I could stay in the bathroom forever! I had a huge vanity unit, personal shower area and a Jacuzzi tub. 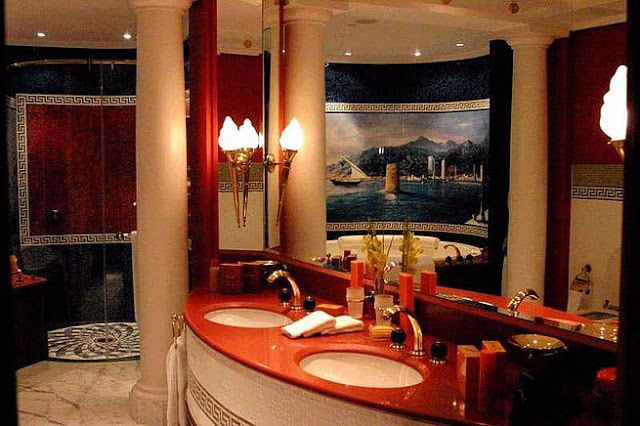 The toiletries in the vanity are all from Hermes, which makes the experience even more luxurious. The hotel would suit those who are in habit of indulgence. It is definitely one hell of an experience for me. What I regret was, I didn't have anyone to share this experience with. So I was there for one night quick stayover. One thing which disappointed was there were no access to the beach. Instead, there is a man-made terrace which adjourned to the sea. The pool area is packed with guests and I couldn't find a sun bed to myself. The room costed about RM4000 per night. 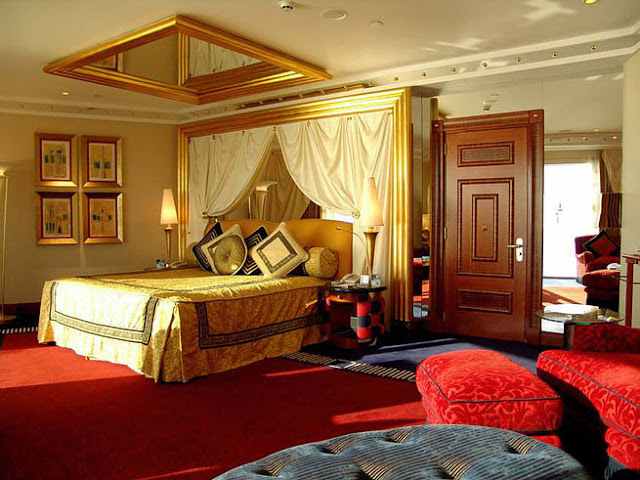 For the ultimate luxury, their Presidential Suite isn't that pricey compared to other hotels. If I remember it was approximately RM22,000, which is what you expect to pay at other 5-star hotel presidential suites.